… if you are male, age 18 to 50, and if you can spend two weeks (or more) at the abbey in July. * The only cost is $25 for registration. 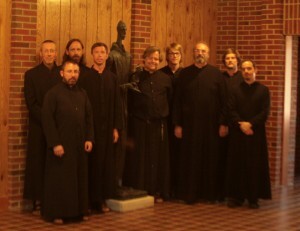 *The summer Program is highly recommended and helpful, but if you are interested in possibly becoming a monk but can’t come in July or stay for two weeks, contact the novicemaster for other options. The first requirement of one interested in the program is a letter explaining something of his sense of vocation or giving reasons for wanting to spend time at the Abbey. He is then sent an application form which requests certain information and provides space for the name and address of a priest who knows the applicant well and would be willing to fill out a reference form. If there are any health or dietary limitations, a medical statement is required. A $25 registration fee must be sent with the completed application to reserve a place in the program. In general, each applicant may suggest the dates for his visit. Those who apply early enough will be able to have the dates they wish; those who apply later may have to alter their arrival or departure dates, since there is room for only eight men in the program at one time. The departure date can be an estimate; the participant may want to stay longer than he first intended, and this will be permitted as long as there is room. The vocationer should bring work clothes for inside and out and a black cassock if he has one. The monks encourage simplicity of life and do not encourage unnecessary expenditures. It is customary for the vocationers to go to Three Rivers on Tuesday evenings to do their laundry. Any needed personal items or toiletries can be purchased on this trip. Work will vary from domestic chores and outside labor to more specialized projects such as sacristy work or clerical assignments. There is no pay for such work, but neither is there any expense for lodging or board. 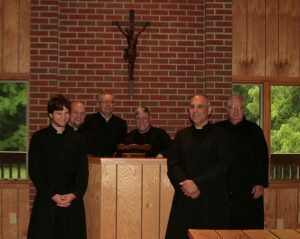 The vocationers’ daily schedule is modeled on that of the monks and includes times of liturgical prayer, private prayer, work recreation, study and classes. 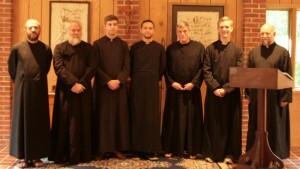 Each vocationer will have conferences with the monk who directs the program, such conferences covering any subjects which both feel relate to his vocation and future, and concerning as well the difficulties of living in such a close-knit group. The training gained in this last area often proves invaluable. 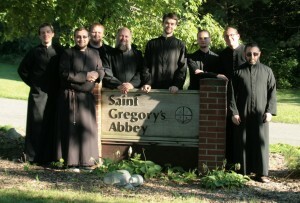 The Abbey requests that each vocationer be willing to follow generously the simple way of life provided. After his participation in the program has ended, he has no more obligation to the Abbey. But while he is here he should realize that the rules of the program are binding. 1. One does not select a vocation for oneself; one tries to find God’s selection for him. 2. Faithfulness to daily duties and charity in the common life are the basis for all vocations. *The summer Program is highly recommended, but if you are interested in possibly becoming a monk but can’t come in July or stay for two weeks, contact the novicemaster for other options.